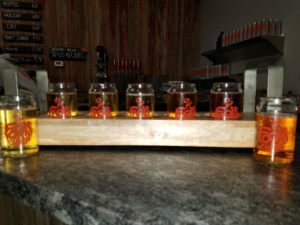 2 Fools Cider opened the doors to their Naperville, IL (a western Chicago suburb) tasting room in December 2016 (the 1st Northern IL craft cidery w/ taproom). The 2 Fools founders, Monte Summers and Jeremy Smith, met in college a couple decades ago. Jeremy was introduced to cider at a young age by his English relatives and began dabbling in home brewing in high school and college. 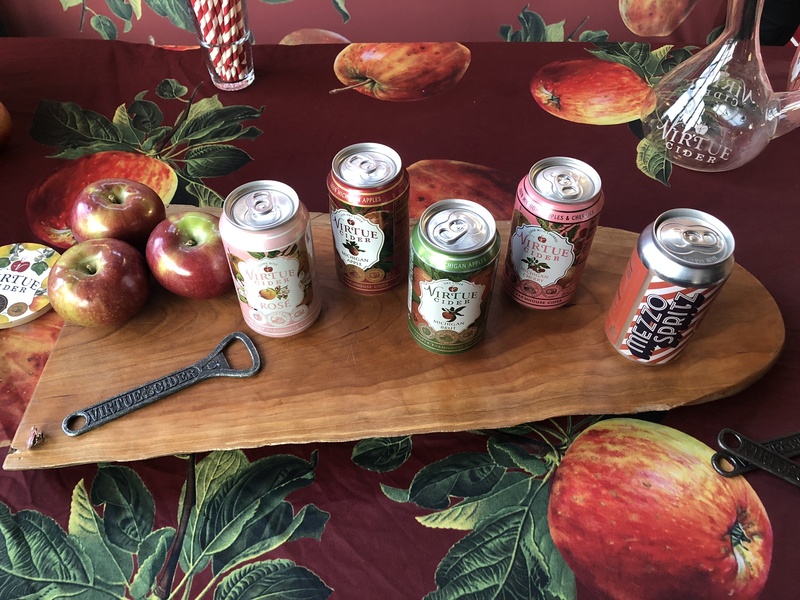 Monte was introduced to cider by Jeremy and he dove straight in studying the science of cider-making at Oregon State University and is now 2 Fools’ full-time cider maker. The brightly lit tasting room has a relaxed vibe where patrons can pony up to the bar or sit at one of the several communal tables in front of picture windows showcasing the fermentation tanks. 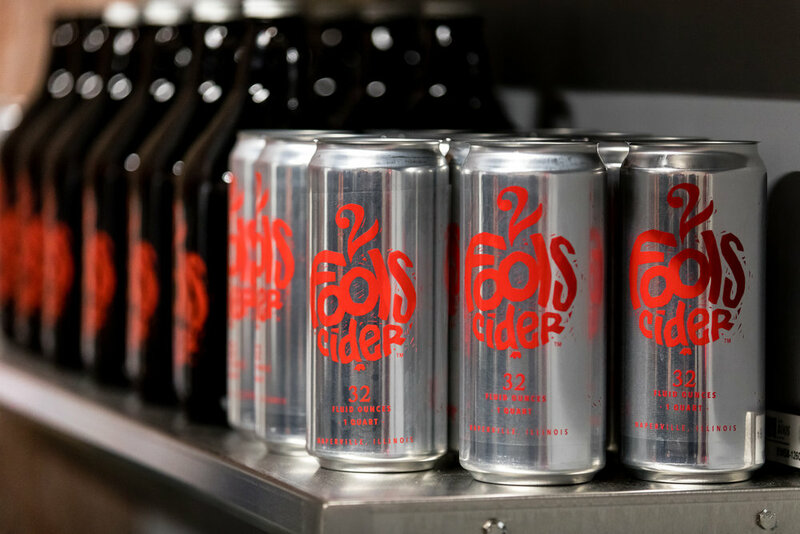 In addition to cider by the glass, 2 Fools offers cider flights (5 samples), and glass or aluminum growlers (i.e., crowlers) for purchase. 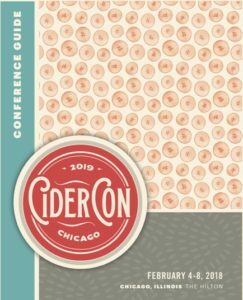 2 Fools, which has a production volume of ~3,000 gallons (~200 kegs), sources their apples from Michigan and uses a blend of Dessert, Bitter Sharps, and Bitter Sweets in their ciders which are carbonated using CO2. 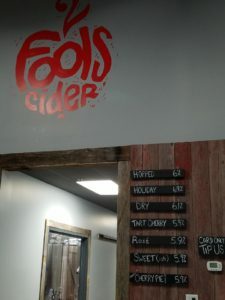 The cidery has eight ciders on tap including cider slushies and coladas (which sounds great for this 90-degree heat we been having). 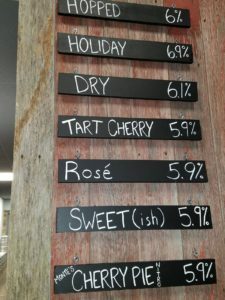 Some of the ciders on tap we’ve tried include their Dry: This dry cider has a touch of sweetness and a bit of tannin which makes it an easy sipper and good base. The crisp apple flavors come through with a slight bit of acidity on the finish. Hopped: Dry + Cascade and Amarillo hops which provide a citrus nose and flavors. The cider finishes with slight tannins. 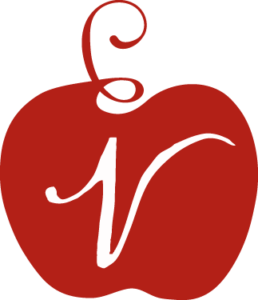 Tart Cherry: Dry+ a small amount of Michigan cherries which enhance the clean apple flavors with a bit of robust (but not sweet) cherry flavors. 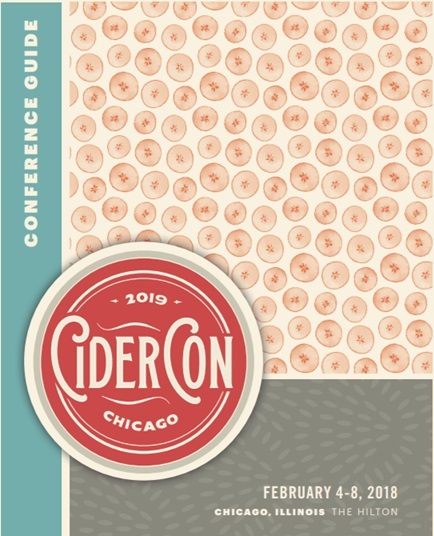 Rose: Dry + a small amount of Michigan blueberries which impart a small amount of berry flavor and a heavy dose of color making this cider resemble Rose wine. Sweet(ish): A sweeter version of the Dry. This off-dry cider has smoother tannins and is a good introduction to craft cider for those who are commercial cider fans.